There is nothing more delectable than preparing lamb for friends and family for Sunday lunch. 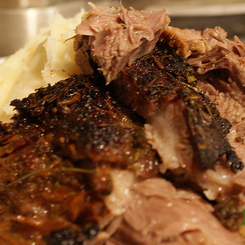 The tanginess of French mustard adds to the unique flavours of this tender and delicious shoulder of lamb (it is very important that the meat is set aside to marinate for 4 hours). If the roast lamb has been frozen, ensure that it is left to thaw overnight and is completely defrosted. Put the French mustard, crushed garlic, soy sauce, thyme and ginger into a bowl. Gradually add in the olive oil, while stirring, and ensure that everything is well combined. Gently rub the mixture over the shoulder of lamb and allow it to marinate in a cool place for 4 hours. You want the meat at room temperature when you pop it into the oven. Place the shoulder of lamb on a rack in a roasting pan, cover with tin foil and roast in a 140 Celsius oven for 3 hours, then uncover, increase the heat to 180 and leave it for another 30 minutes or so. You want a nice dark crust on the outside. Once the lamb has been roasted, it is essential that it is left to rest for about 15 minutes before carving (this helps to retain juices, which enhances flavour and prevents the meat from becoming dry). If you have ever cut into a roast and had juices flood your cutting board, that is because the moisture in the meat is still too hot, simple as that. Remember to make a delicious gravy to accompany this great lamb dish. By spooning off some of the fat and using the juices that are left behind in the roasting pan, you will get all the necessary flavours. Hi Graham, thanks so much for a lovely recipe. Will definitely give it a try and will let you know. Have an awesome Christmas with your family and friends. Talk soon.